But at the moment, different government organisations collect money from people in different ways. It’s not a good user experience, and it’s not very efficient. So, in the last few months, a team at GDS has developed a prototype cross-government platform that will improve the way government takes these payments. This initiative is part of the Government as a Platform programme where GDS works with departments and agencies to improve digital services. Competitive e-commerce companies spend lots of time and effort creating a seamless check-out process. They design easy-to-use payment pages, and offer users a choice of convenient payment options. We think government should be able to do the same thing, making public sector payments equally user friendly, both on mobile devices and desktop computers. Nearly two million adults in the UK don’t have a bank account, so it’s important that alternative payment methods are available for them. These could be provided through services like PayPoint, Payzone or the Post Office, which enable citizens to pay for government service with cash in their local store. New digital services often need to accept payments too. 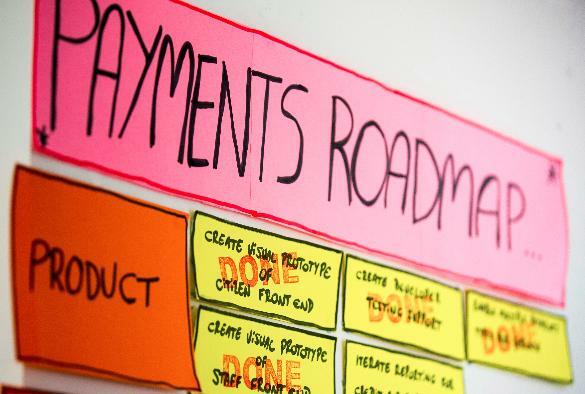 Right now, the teams building those services have to procure and integrate a new payments system - which takes time. Product teams wouldn’t have to worry about this responsibility if a single platform maintained relationships with payment providers, and that’s exactly the scenario our development team is exploring. Government services could integrate with the Payments Platform through simple APIs we’ve developed. In our prototype, developers can trial the platform in a “sandbox” that has self-service capability, allowing them to test the frontend payment user journey and the backend financial tracking functionality. Using the platform would make it quicker and cheaper for the government to launch new services, since it avoids unnecessary repetition of the same procurement and integration work every time. Managing the reconciliation of payments across multiple payments types, such as cards, direct debit and e-wallets, is currently a complex process that involves many manual steps. Providing one reporting interface that shows all payment types and providers could make this process more efficient. Providing detailed and timely transaction information would help government call centres keep citizens better informed about the status of their payments. More accurate information could also reduce government costs of running these call centres. Government organisations issue millions of refunds to citizens each year, and there’s an opportunity to make this process more efficient and secure. Instead of refunding card payments with cheques (which is what often happens, even today), it could become standard to issue full or partial refunds directly to the cards used to make the original payments. That’s not just more user-friendly, it also helps prevent fraud. The Payments Platform could help government take advantage of new innovation in the financial technology industry. At the moment, each government service is directly integrated with certain payment and security functionality, making it tough to launch new products. For a cross-government change to happen, hundreds of services would have to adapt their existing front- and back- end integrations. That’s a great deal of work. By contrast, a single change made within the Payments Platform would instantly be available as new functionality to every service using it. Very little work, resulting in instant, cross-government change. 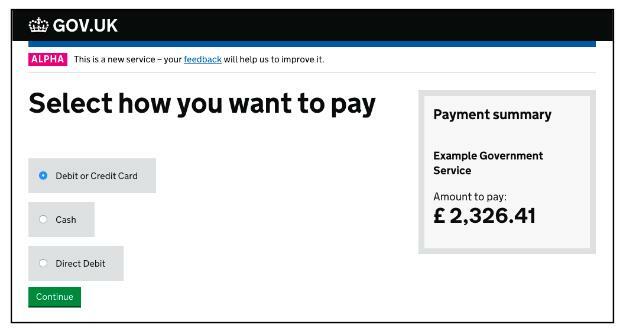 During the alpha we’ve developed easy-to-use payment pages that match the GOV.UK design guidelines. Together with DWP and the Insolvency Service we’ve tested these pages with citizens and made multiple iterations of the design. We’ve also developed an initial version of the backend that civil servants will use to do reconciliation, provide user support and issue refunds. Exploring what support developers in government organisations need to integrate with our platform was another focus of our alpha. Don’t forget: we’ve only just finished the alpha. These pages will almost certainly change as a result of feedback and user research. During our beta phase we’re planning to integrate with two or three government services and start taking card payments in a secure and reliable environment. We’ll then focus on fine-tuning the API and the self-service components, making it as easy as possible for government services to adopt the platform. We’ll also add new payment types so that users can chose the most convenient way to pay. We’ve already had close conversations with the main government organisations that take payments, and we’re keen to talk to more. If you’re in a finance department, product team or call centre and would like to share your experiences, please get in touch. Follow Till Wirth on Twitter and don't forget to sign up for email alerts. Are there any plans to support purchase orders or BACS? Whilst designing Vehicle Operator Licensing, which is a Government-to-business service, we've found that often the person responsible for making a payment doesn't have access to a company credit card. We're focussing initially on debit and credit card payments but are keen to explore other payment types as well. The goal of the payments platform is to make it easier for citizens and businesses to pay government. That includes providing a variety of payment types for government services. Quite interested in this, if it ever gets beyond the prototype stage. Please share what you have done in creating APIs to access the general ledger, and clarify who owns the liability for errors and fraud. Also, please explain why having this intermediary layer between the departments and the commercial providers doesn't actually increase the risks and create a lack of accountability. Hi Fred. We're actually just about to start work on our beta, in that phase we'll also consider which code is appropriate to share. Of course, we'll be looking at security closely. We'll follow up with a blog post where we present the outcomes of our user research and engagement with departments. Hello, will Government as a platform be available for Local Government to use as we take large amounts of payments,etc? Yes, that's definitely a possibility. Our immediate plans are to focus on central government. I'll get in touch with you to understand your needs in more detail. Out of interest what payment providers have you considered? Will the payments be on site but using something like Stripe to minimise scope for PCI DSS? The first thing we think about is which payment types (e.g. credit card, direct debit, e-wallets, etc) are appropriate. The second thought is about which providers are the right fit. To your second point, we’re taking PCI-DSS very seriously and agree that reducing the burden for government organisations is one of the many benefits of a Payments Platform. Why no Apple Pay ? Great question. That's one of many interesting payment providers we’re looking at but we haven’t firmed up any plans. Yes, please! It's shocking that in 2015 users of both public and private sector services have to deal with horrible payment systems. Thanks! We completely agree. As I say, what we're looking to achieve is very little effort for the user. As part of our work towards Government as a Platform, we are focussing on user needs first.